Along with informative links, some posts contain affiliate links,thank you for supporting this blog and our family by purchasing through my links! This has been one of the rainiest springs in East Texas that I can remember! (Thanks El Nino) With all this lovely rain, out comes the mosquitoes!! I swear some of these blood sucking parasites are the size of pterodactyls so you do not want to mess around with these guys at all!! Mosquitoes makes it pretty miserable just to be outside. The kids come in with whelps from playing and doing yard work while swatting bugs is very annoying. Besides, the poor animals are being attacked as well, which can cause heart worms in your pets. 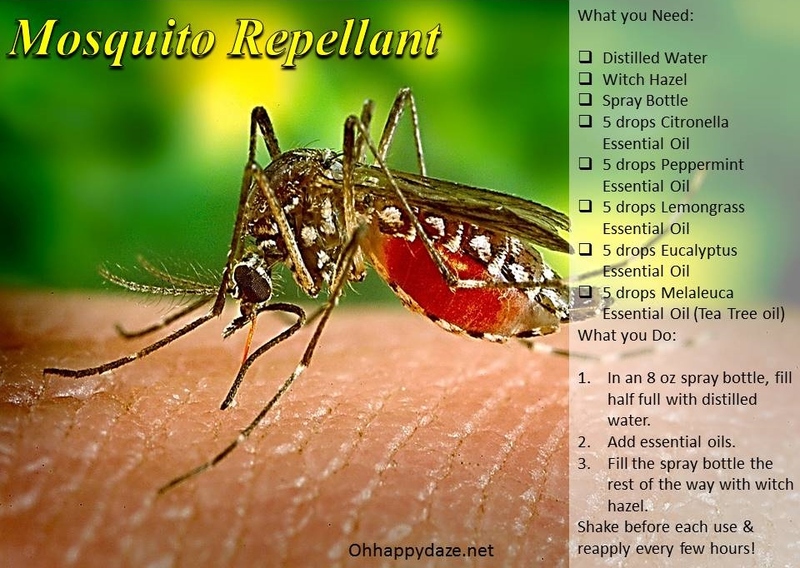 So I wanted to post about the several ways you can reduce the number of mosquitoes in your yard, since that is what is “bugging” me lately! Any time it rains we have to go back around the yard and dump any buckets, toys, wheel barrows, pots… anything that can hold water because mosquitoes are water breeders! No where to breed, no reproduction! Purple Martins are great to have around where there are large quantities of mosquitoes! Buy or build a few Purple Martin House and reduce your inspect population! Add a Bat House to your buy/build list!! There is something quite gratifying when you hear the little “Bzzzt” every time the “Bug Zapper” makes a kill! It works at night, decreasing the mosquito population while you sleep! Citronella Candles for Outdoor Events! Prep your jars with a wick by dabbing the metal flat part of the wick with wax and pushing it with a wooden skewer to the bottom of a jar to hold it in place. Then tape the top tip of the wick to the skewer and lay it across the jar mouth so it holds it upright until you get your citronella wax in the jar and firmed up. Melt 4 cups of soy wax chips in the microwave, 4 cups at a time. Takes about 3 minutes. Make sure your soy wax temperature is at 180 degrees. Let it cool to 140 degrees then add 15 drops of Citronella Essential Oil. Mix and carefully pour into jars. Let the candle(s) sit 48 hours before moving them. How to keep them off YOU! 1.In an 8 oz. spray bottle, fill half full with distilled water. 3.Fill the spray bottle the rest of the way with witch hazel. Shake before each use & reapply every few hours! 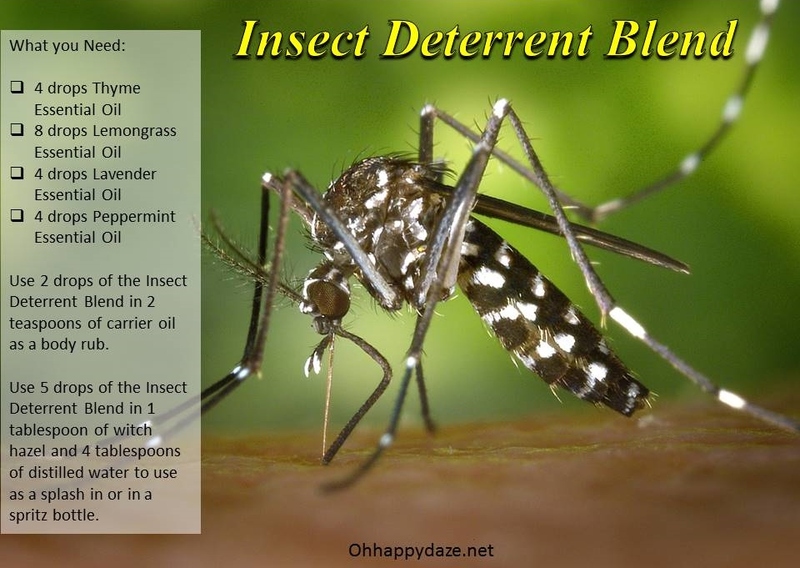 Use 2 drops of the Insect Deterrent Blend in 2 teaspoons of carrier oil as a body rub. Use 5 drops of the Insect Deterrent Blend in 1 tablespoon of witch hazel and 4 tablespoons of distilled water to use as a splash in or in a spritz bottle. Use 2 drops of the Insect Deterrent Blend on cotton balls or fabric strips in the area you wish to deter insects. Worwood, Valerie Ann. The Complete Book of Essential Oils and Aromatherapy. San Rafael, CA: New World Library, 1991. 52-53. Print. A Citronella & Cedarwood Combo has been a popular remedy against mosquito attacks for many year prior to modern insecticides! Lawless, Julia. The Encyclopedia of Essential Oils. New York: Fall River, 2014. 75-76. Print. Posted on May 8, 2015, in Garden, Homesteading, Oils & Herbs and tagged Inspect Repellant, Mosquitos. Bookmark the permalink. Leave a comment.